Another PascalCoin (PASC) pool, one brought by Suprnova, seems to be now open for beta testing, though apparently not fully functional. The new pool brings much better support and functionality as compared to the first available pool from Nanopool, so you might want to check it out. The PASC Suprnova pool offers Stratum support and comes with the familiar sgminer with support for mining PascalCoin on both AMD and Nvidia GPUs, though apparently a version of ccMiner will also soon be available for Nvidia miners… there is also a Windows and Linux miner available. The pool has not yet found its first block and the payment part does not seem to be fully functional yet, but you can still try the miner and point some hashrate to help in testing things out. The pool fee is 1% and you should be able to do manual payout and not have a minimum payout limit, also stats is working much better and reported hashrate is quite accurate on miner/poolside, the stratum support also should ensure better efficiency. 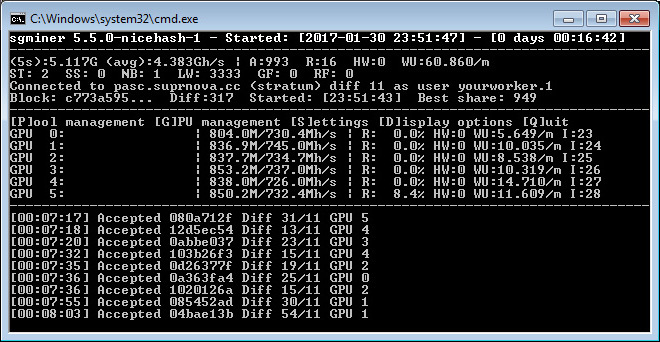 We have given a try of the Windows miner and have noticed it does tend to have a pretty high CPU and memory usage, but it does still seem to work well.